Confab  showed me that we have a community of people who are spending their time sharing and learning from each other about how to change their organizations so that they can start to get hold of the overwhelming problems associated with content strategy, web strategy, and web governance. That’s a tough act to follow. There was no standing ovation this year, and the shock factor was weaker because most of us had either attended last year or had high expectations after hearing about it from colleagues and friends. Although the adrenaline levels were lower, that’s a sign of the growing maturity of the event, and the community it serves—after the initial excitement of, “we exist!” comes the long, painstaking work of implementing our visions in the reality of our antiquated organizations. I was a speaker at Confab last year and I count the organizers as both personal friends and professional colleagues. This magazine is closely aligned too: production director Erik Westra is Captain Confab himself, and editor Erin Kissane was a speaker both years. Perhaps that’s the point, though: we aren’t old friends who decided to sit around bigging up each other’s achievements, but rather practitioners who became colleagues and friends through working together to build a broad-based community around the discipline of content strategy. That’s the overarching message of Confab: you, personally, need to get involved in this community, because unless we work together, we have no hope of making progress. Confab is part of a new vanguard of events that couldn’t exist without social media—let’s call them post-Twitter conferences. 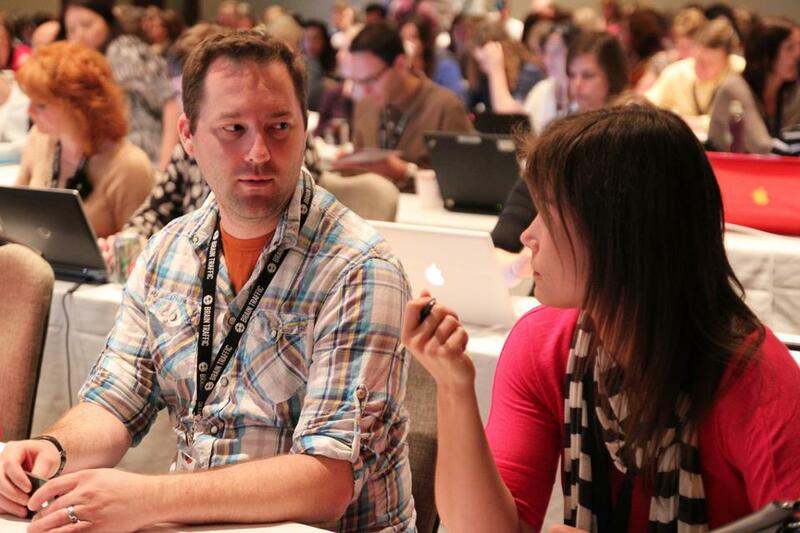 As Kristina Halvorson, founder of Confab, put it on a conference call, “a few years ago, we never could have found each other.” From the outside this community might look like a bunch of writers working ourselves into a frenzy about how important content is, and why people should appreciate us more. 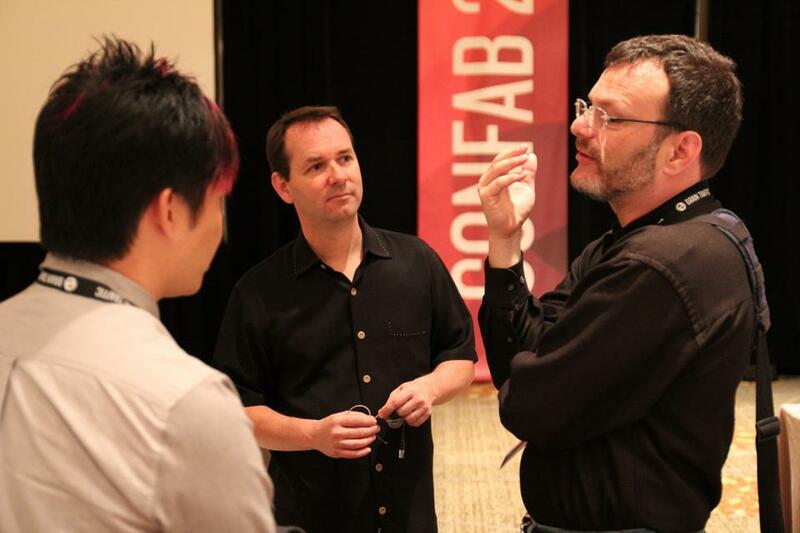 Confab speakers: Kevin Cheng, Dan Roam, and Lou Rosenfeld. Photo by Sean Tubridy. While you’ll find that attitude in the occasional blog post tagged “content strategy,” in reality the community is multi-disciplinary (not only writers), and the theme isn’t so much a lack of appreciation as an honest appraisal of the problems we face. In our culture generally, and in our antiquated, factory-like organizations in particular, this kind of radical honesty is subversive. When we share our failures, honestly appraise the difficulties our organizations face in adapting to a changing world, and call out the true costs of siloed working practices, we can feel so out of step that we wonder whether we’re insane, and everyone else is doing just fine. I can’t count the number of people I met at Confab who told me how relieved they were to find that they weren’t, in fact, insane—that there are other people out there who face the same challenges. So the true purpose of Confab, I think, is to connect with, learn from, and share with people who are ready to be honest about how difficult this stuff really is, and to work together toward a solution. We need structured content at an organizational level, and we can use mobile as a “wedge” to make the case. To make that happen we’ll need to disrupt our organizational structures and our internal processes. We need effective digital governance that crosses organizational silos. Disruption again. Our content strategies can’t be effective until we learn to build business cases for them—that is, we need to start selling our content strategies to executives. The only way to make progress is to start with small pilot projects, demonstrate successes, and admit failures. This is scary work, and we need to leave our comfort zones to do it. Whether you attended this year or not, now’s the perfect time for you to get involved. Write a blog post, attend or organize a meetup, and pitch a talk about a truly difficult topic to a conference. Get out of your comfort zone every day. 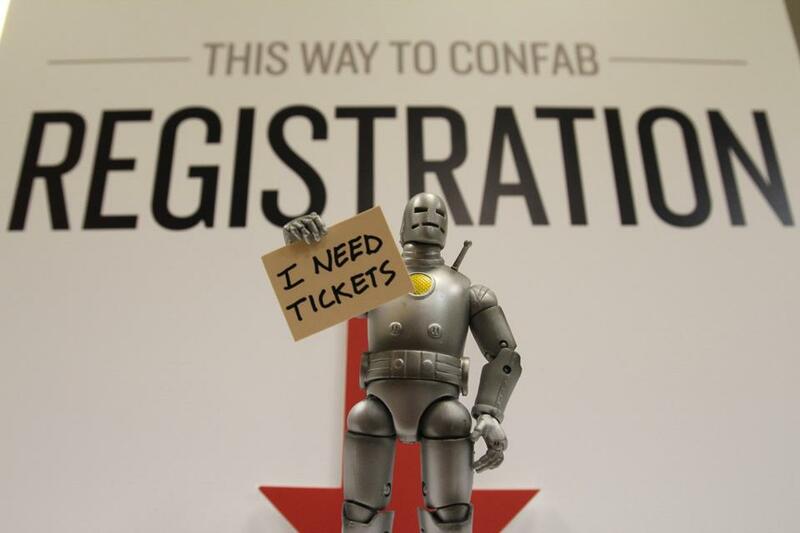 I’ll see you at Confab 2013. We put out a call for Confab write-ups and dozens of posts rolled in, so in addition to the brief excerpts here, we’ve assembled a Confab 2012 reading list at Readlists.com, where you can catch a more comprehensive list of posts—and even export the collection to epub format for later reading on the device of your choice. Thanks to all of our submitters. Let the right ones in. Photo by Sean Tubridy. Content Strategy is a melting-pot. I sat next to a VP of Business Development from a top search engine. I met creative directors and people from Interactive teams. Copywriters, magazine editors, PR professionals, web designers, SEO geeks and librarians. Melissa Rach’s session on Content and Cash gave me strategies to eliminate fear and to assess the value in scoping projects with new vendors. Her talk was a phenomenal primer in client and project management. Karen McGrane finished the conference with an inspiring talk about adaptive content. We can use mobile as a wedge. It is waking people up to see that content has multiple sizes and meaningful metadata and needs to be written for reuse. When this comes together, structure is expressed through styling. Because of this, content people need to work more closely with designers to make things happen. We need to think about how we are in the content publishing business, one in which we can account for all devices, even those not invented yet. Kate Kiefer Lee kind of said it all: “It’s not about writing, it’s about understanding people’s feelings.” If there’s one thing we must always remember, it’s that we’re creating content for humans. Content strategy does no good if you don’t keep it up. Ann Rockley summed it up best when she said that companies are happy to pay for a new website over and over, but they are not willing to pay a little extra to do it right the first time. Why? Because doing it right is hard. Governance defines who does what, when, why, and how. It needs ongoing resources and attention. She used the garden analogy to help others understand content and governance. If you plant a garden in the spring, it looks really nice for a little while. But if you don’t water it or weed it, soon it is overgrown and ugly. Same thing happens on a website. How do people comprehend the content you’re trying to present? The context in which they receive it, the device they’re on, their mindset, their location will affect their ability to comprehend. Remember, people are consuming your content, so you have to make sure you understand the behavioural, situational and environmental context they will be in if you are to create a contextually relevant content strategy and ultimately get engagement. Despite all the enthusiasm for structured authoring, I didn’t hear much about the nitty-gritty technical details. In fact, in one presentation, the speaker talked extensively about metadata, and had us map out a taxonomy for a website. The idea was that through metadata, the content management system (CMS) would dynamically pull content into various spaces on the website based on the metadata and content model rules. Attendess before the general session. Photo by Sean Tubridy. 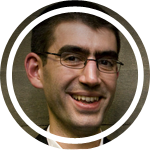 Jonathan organizes events (Content Strategy Forum 2011, London Content Strategy Meetup), presents worldwide, and writes (A List Apart, lucid plot) about the revolutionary changes facing organizations, through the lens of UX, content strategy, and governance. Originally a web developer, he’s worked as an information architect and user experience consultant, and he’s a content strategy advocate. He founded Together London in 2008. “Field Report: Confab 2012” appeared as a Field Report in Issue #3. Issue illustration by Yesenia Perez-Cruz.